This “dessert” couldn’t be easier or more festive for celebrating 4th of July. You only need three items, strawberries, white chocolate, and blue sugar sprinkles. Another great treat to make with your kids. The best part is, it’s healthy and there is no baking involved. Wash and dry the strawberries. Take white chocolate chips or break up a white chocolate bar into a microwave-safe dish, microwave for 20 seconds, mixing occasionally, until melted. Let cool. Pour blue sugar sprinkles onto a plate. Take a strawberry, dip in the white melted chocolate until 3/4 of the berry is covered, dip in the blue sugar just until the tip is coated. Repeat with remaining strawberries. Place on a cookie sheet, set in the fridge for a few minutes until the chocolate hardens. Cook’s Note: To make these for any other occasion, instead of blue sugar, dip in mini chocolate chips, crushed nuts, or crushed pretzels for that sweet/salty flavor. 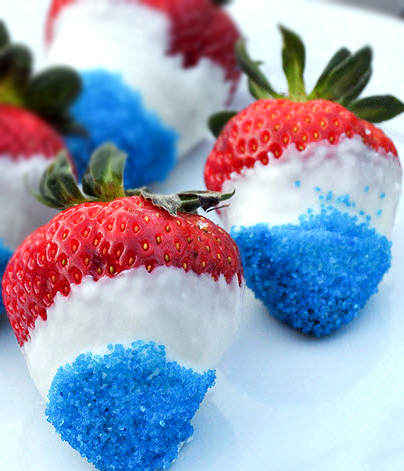 One of the easiest 4th of July desserts ever! Yes, the good thing is, there is no baking involved…especially good when it’s so hot outside. I’m not American, but this is super festive!! 🙂 I could probably change the blue sprinkles to red sprinkles for Canada Day! Definitely. I included a note at the bottom of the post mentioning all the different dippers that you can have, e.g. mini chocolate chips, nuts, etc.